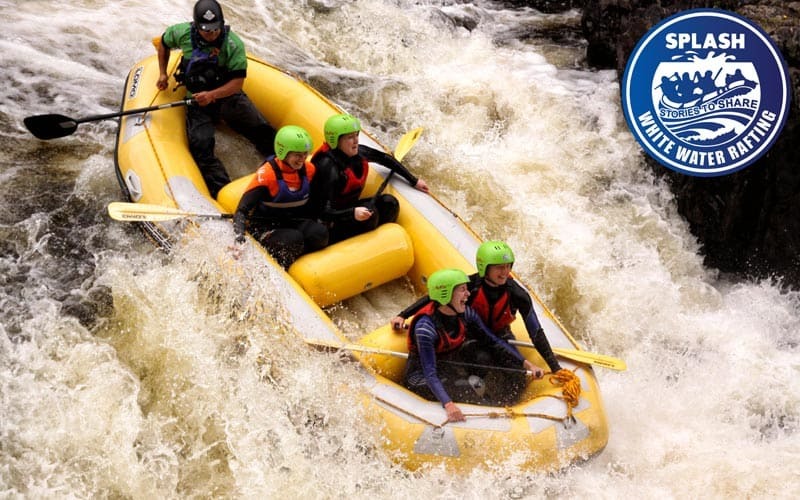 A half day white water rafting trip on the River Tummel costs £50.00 per Adult. Private rafts can be booked for just you and your friends: Please inquire for price. We offer discounts for groups (12+). Please see our prices page for the latest prices or call. At Splash our River Tummel rafting trips have a maximum of 6 people per raft. The minimum age for rafting the River Tummel with Splash Rafting is 16 years old. We can provide transport for groups from Edinburgh and Glasgow. We can also provide accommodation in Perthshire and Edinburgh. Splash is running River Tummel trips every Friday evening (18.00). Plus all day on Saturdays (09.30am, noon & 14.30). Plus Sundays (09.30am & 13.00). The rafting runs from June until the end of September. We can also arrange special trips on request on Saturday evenings – get in touch and we’ll do our very best to get you on the river when you want. Activity – What is Rafting? 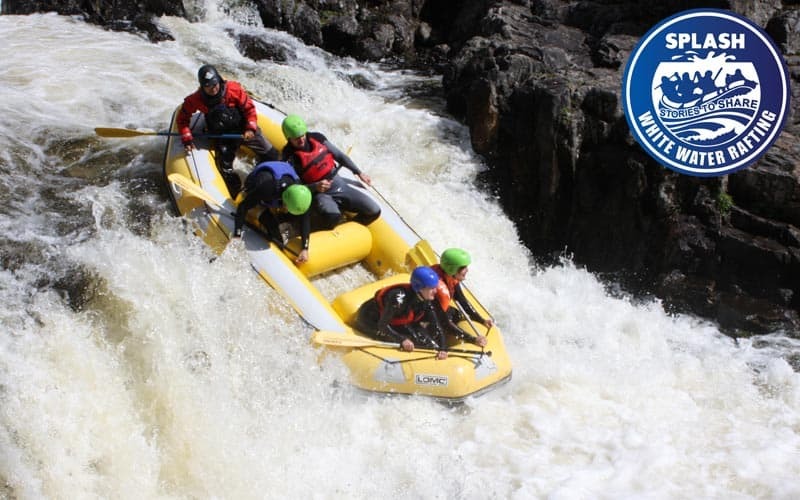 White Water Rafting is one of the most exciting river activities ever created. 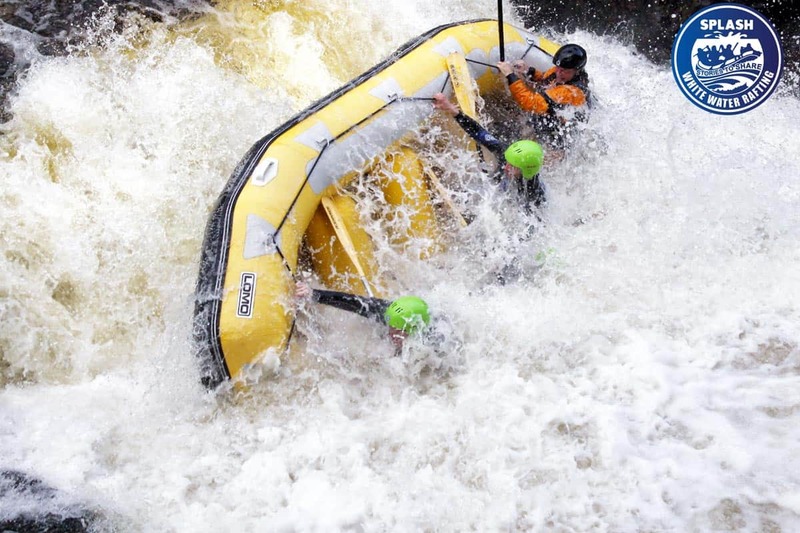 White water rafts are engineered to handle everything the river can throw at them. 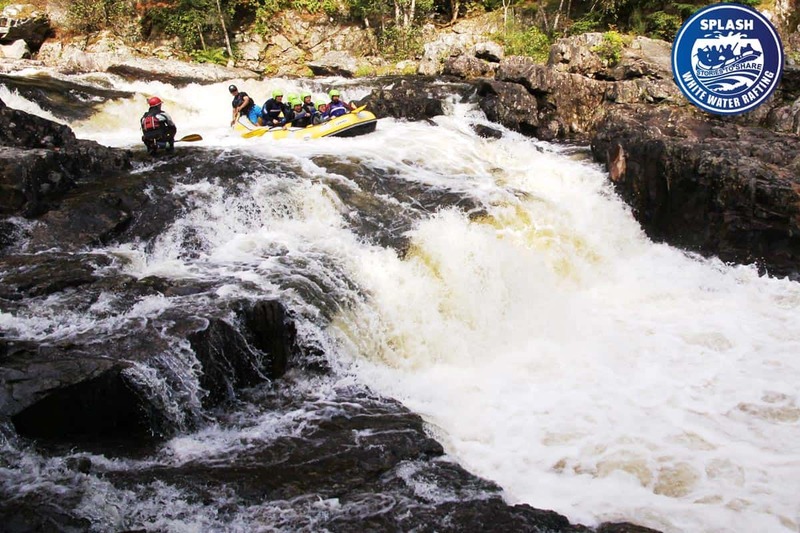 You and your team will work with one of our experienced guides to navigate the rapids. The rapids come in a grade from 1 (flat, scenic) to 5 (high adventure/ risk) . We have access to many rivers from the fun and bouncy Tay (Grade 2 and 3) to the mighty Orchy ( Grade 3,4 and 5). See you on the river. Splash River Tummel White Water Rafting is situated just north of Pitlochry. Pitlochry is in Highland Perthshire Scotland. The River Tummel is like no other in Scotland. The rafting experience will get you working together with our guide. You need to power the raft through beautiful deep pools, down through technical rapids such as ‘Zig-Zag’ and ‘Sharks Tooth’. The main part of the trip is Grade II/III. This prepares you for the final ‘piece de la resistance’: a two-tier, 18-foot drop (Grade IV) rapid. This drops into the mystical Loch Faskally where we float away from the falls towards home reflecting on the rivers powers and beauty. 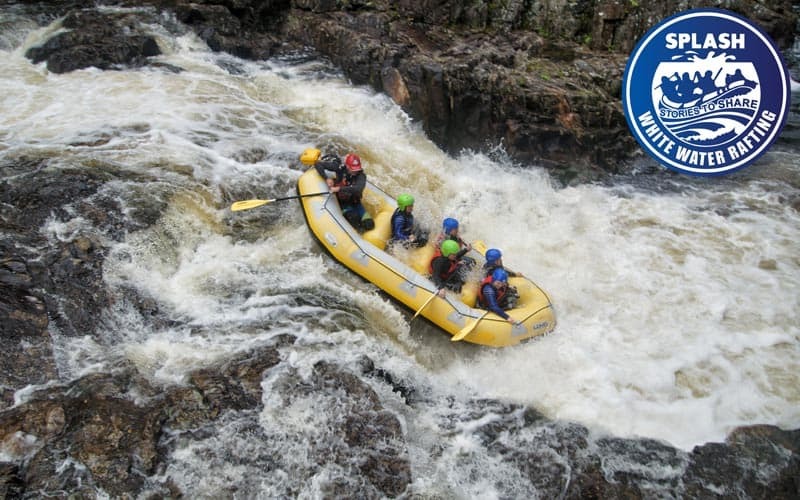 The River Tummel White Water Rafting season starts each year on the first weekend of June. It then runs every weekend until the end of Sept. Thank you to all Splash customers who tackled the River Tummel White water rafting during all previous 20 plus seasons. We have been running this river a long time now but still, love every river trip. Judging by the number of reviews, positive comments and recommendations we receive after each rafting trip we think you love it as well! We look forward to welcoming new guests on the coming rafting season. Our busiest times for River Tummel rafting are Saturdays in June/July. So if you’d like to ensure you are able to join us please give us a call on (01887) 829706. Or if you prefer to email us and we’ll provisionally book your slot. On ALL rafting trips, Splash provide free professional white water rafting photos ! We encourage all customers to download & share their photos with friends & family. Budget Friendly Weekend in Aberfeldy – 2 nights in our Bunkhouse plus rafting – £95pp ( based on 14 staying) – add river Bugging for £45pp. Self Catering Lodges – Highland Perthshire only 10 minutes drive from the River Tummel. 6-8 people per lodge plus rafting £90-£125pp for two nights plus rafting. 4 Lodges available ( Add River Bugging for £45pp) Prices vary depending on dates and how many invlocved. Ever heard of River Bugs? Think of a big inflatable armchair which you float on down the river! Perfect if you’d prefer to experience the river on your own or in groups of single people. 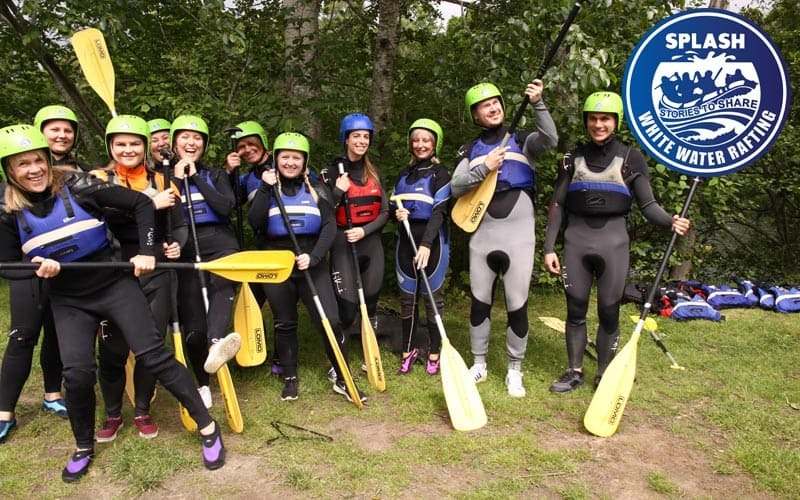 At Splash we offer a full day dedicated to the activities on the River Tummel, combining White Water Rafting and River Bugging for an exhilarating day of fun for just £85 per person. River bugging is more challenging than the rafting and more adrenalin buzzing. Therefore it is for those seeking that higher adrenalin fix! Many of our customers who’ve enjoyed rafting have also joined us canyoning. We run a range of canyoning with Keltneyburn and Acharn canyons being our most popular. Combine your rafting trip with canyoning for just £85 per person. Or you might prefer to experience adventure on water and land all in one day: for just £90 per person Splash offer Rafting plus Mountain Biking, Paintball or Quad Biking. All equipment is provided as well as experienced and fully trained guides – book your trip today! We hope to welcome you for one of our many other adventures like the River Tay rafting or River Orchy rafting, or trips further afield in Morocco or Spain. We have lots of accommodation partners in Aberfeldy and the surrounding Perthshire area. We can provide camping all the way through to to 4 star Hotels to accommodate everyone’s budget and choice. End of season white water rafting and river bugging experience. A great morning of adventure with Johannes, spills and thrills literally as expected. Looking at rapids afterwards couldn’t believe we had gone down what was a v rough section. Then an afternoon or river bugging – very apprehensive but real supportive crew of Aivars and Johannes personally attending to my enjoyment down the Tummel rapids. Excellent safety briefings on both occasions. Huge encouragement and a very rewarding time. Thank you Aivars and Johannes form my experience – if only I was 40 yrs younger i’d Be taking up this new sport. Big thanks to the Splash team for an awesome experience on the Tummel, and great memories from their fantastic photography. Pictures were available online before we sat down for dinner that evening. Hell of a ride, wanna do it again tomorrow! I booked this trip as a surprise for my husbands birthday and boy oh boy it didn’t disappoint. We arrived and were immediately greeted by Chris and Steve who were both really friendly, fun and excitable about the next few hours and what we’d endure. The tummel itself was exhilarating and we never felt unsure or uncertain at any time, Chris was so reassuring and calm it really put us at ease. I even asked him to sing some of his commands to which he obliged and had us all laughing as we journeyed down the Tummel. The final rapid section and 18ft drop was jaw dropping and despite never having rafted before we weirdly felt in control and it’s all thanks to Chris and his guidance and support. You underestimate the workout you get for the hour you’re on the boat so prepare to feel a little stiff the next day! Would recommend it in a heartbeat and the free photos from David the photographer was the icing on the cake. Top notch service and bloody brilliant afternoon out. Anyone thinking about doing it, don’t think….. just do! We have been rafting on many different rivers all over the world. Thoroughly enjoyed this half day adventure on the beautiful Tummel. Somewhat different than the usual type of rafting we have done as this river does not have high water volume but is very technical with lots of rocks and one big, fun, breathtaking stairstepped drop at the end. Our guide Steve was very good and lots of fun! He has us laughing and smiling the whole way. Highly recommend this adventure! You will be provided with everything you need to raft safely on the River Tummel. However we do ask you to bring an old pair of shoes to wear on the river (These will get wet), and your swimwear for underneath your wetsuit. Optional – a non-cotton T-shirt (synthetic materials are best ) for under your wetsuit. Depending on the time of the year warm clothing for before and after your trip. Meet at HQ or Tummel site for River Tummel bugs – Depends on where you are staying or traveling from. Follow the A9 North from Perth past Pitlochry, take the road signed ‘Clunie and Foss’ on the right hand side (look out for the Splash sign beneath it). About 2 miles down this road you will see the huge stone Clunie Arch – go through this and follow the road down to the picnic area where we will be waiting for you. Look out for a white marquee at the end of the field. If you are coming from Pitlochry, go north out of town then, come back onto the A9 heading south and go over the loch. Take the first left at the ‘Clunie and Foss’ sign and follow the directions above.